The Infinity Engine is a fantasy computer role-playing game engine designed to simulate the pen-and-paper fantasy role-playing game "Dungeons & Dragons" in real-time. The overall design was so popular that with only minor variation it produced several other extremely popular titles. There was a great hue and cry when the decision was finally made to drop the essentially 2D format and go with the full 3D Neverwinter Nights, and unofficial use and development of the engine continued long after the engine was obsolete. Although the engine was not officially released (unlike Neverwinter Nights, where modding was an integral part of the design), fans hacked the game and very quickly developed their own tools. TeamBG emerged the leader in both tools and tutorials, and very impressive mods were made. The Widescreen Mod allows the Infinity Engine games to be played at previously unsupported resolutions. The mod allows you to choose one resolution (including widescreen resolutions) and can be uninstalled if you change your mind. EasyTutu allows you to play Baldur's Gate and Tales of the Sword Coast using the Baldur's Gate II engine. As the screenshow below shows, it is compatible with the Widescreen Mod. The scene pictured is near the very start of Baldur's Gate, shortly after speaking with Imoen and just before reporting to your foster father Gorion, who is anxious that you leave Candlekeep soon. EasyTutu comes with several interesting add-ons that are definitely worth investigating. One such is the NPC Kit Selection which allows companions (which you do not create, but who join you during the game) to access the expanded career options in Baldur's Gate II. The Infinity Engine organizes its data with a "chitin.key" file, and using that map, BIF archives can be deciphered and modified. 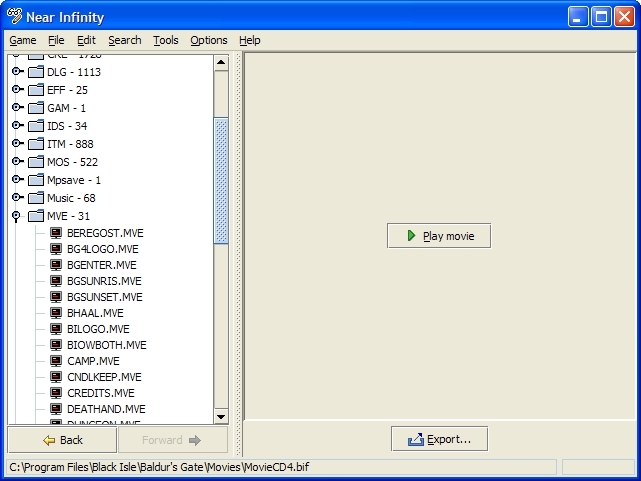 WinBiff is a modder's tool that examines the Infinity Engine "BIF" files individually. At a basic level, it's useful for mass-extracting files, especially if you know where they are. For example, if you knew character portraits were all in gui.bif, you could choose the files you wanted from that BIF and extract them all at once. If you don't mind having Java on your computer, you can use NearInfinity, which is friendlier as an explorer's tool. It collects all BIF information and sorts them by file type. All BMP files are lumped together, for example, and if you were interested in just those, you don't have to hunt them down one BIF file at a time. 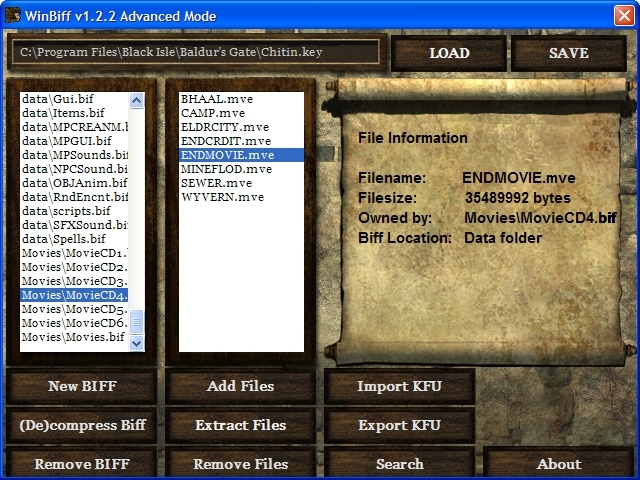 Also, it supports useful previews of each file archived in a BIF and you can, for example, play the MVE format in-game movies without having to look for a file converter. If you are going to use WinBiff or NearInfinity to explore graphic files, you may also want to get the MOS Utility. Each area that can be explored in an Infinity Engine game is made up of possibly thousands of map tiles (TIS files). You can preview these tiles with NearInfinity, or you can preview the entire area in a single but smaller map in MOS format. The MOS Utility is a small utility that converts MOS files into common graphic file formats. Many other graphics, such as those used for the GUI and the interesting mosaics in Baldur's Gate II, are also in MOS format. Some of the MOS files with the BIF archives are compressed, and must be decompressed first (e.g., using NearInfinity) before MOSUtil can process them. To explore the geography and locales of the Infinity Engine game series, two excellent sites are Mike's RPG Center and Game Banshee.